Here’s to taking care of your knees, to chewing better, and to troubleshooting what is really making you gloomy on gloomy days (hint: it's not the weather). Many a New Year’s resolution aims at eating better, exercising more, and being happier overall. As luck would have it, another exceptional year of research at BYU churned out findings that can help you with all three. Here’s to a healthier, happier 2017. Kyle Anderson runs as part of the study on knee inflammation. Photo by Nathaniel Ray Edwards/BYU Photo. Running probably doesn’t sound like the most knee-friendly activity. 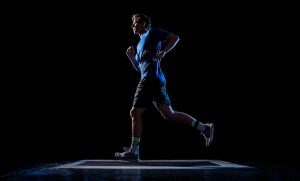 But a recent study by a group of BYU professors shows that joint inflammation actually decreases after running—a fact that “flies in the face of intuition” says exercise science professor Matt Seely. If you want young knees, you gotta pound some pavement. “What we now know is that for young, healthy individuals, exercise creates an anti-inflammatory environment that may be beneficial in terms of long-term joint health,” says the study’s lead author, exercise science professor Robert D. Hyldahl. The takeaway: Do your knees a favor and put on those running shoes. Read more. A woman eats a pretzel with her headphones blasting music. Photo by Jaren Wilkey/BYU Photo. Listen up, snackers. Paying attention to the sounds of your eating may aid in portion control, according to a study by researchers at BYU and at Colorado State University. They call it the “Crunch Effect”—people who are aware of the sounds of their eating actually consume less. And conversely, people who are watching loud TV or listening to loud music while eating consume more. Tuning in to your munching may not seem significant at first. “The effects may not seem huge—one less pretzel—but over the course of a week, month, or year, it could really add up,” says Ryan Elder, assistant professor of marketing at BYU’s Marriott School of Management. 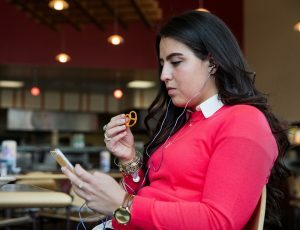 The takeaway: Take out the earbuds and tune into the symphony of your snacking. Read more. 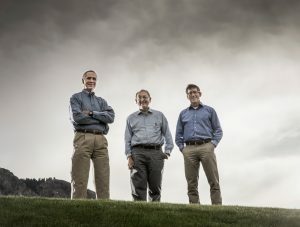 BYU professors Dennis Eggett, Lawrence Rees, and Mark Beecher combined their knowledge of their respective fields to study the effects of weather on emotional distress. Photo by Nate Edwards/BYU. The idea that gloomy days make us, well, gloomy, is not new. But new BYU research shows that it is not really pollution, or rain, or wind, or the temperature that bring us down. According to a BYU psychologist, a BYU physicist, and a BYU statistician, the variable that really takes a toll on our emotions is the amount of time between sunrise and sunset. "That’s one of the surprising pieces of our research,” says Mark Beecher, clinical professor and licensed psychologist in BYU Counseling and Psychological Services. “On a rainy day, or a more polluted day, people assume that they’d have more distress. But we didn’t see that. We looked at solar irradiance, or the amount of sunlight that actually hits the ground. We tried to take into account cloudy days, rainy days, pollution . . . but they washed out. The one thing that was really significant was the amount of time between sunrise and sunset.” The takeaway: Get your rays and, especially during winter’s shorter days, take extra measures to keep morale high to offset the lack of sunshine. Read more.